The Paul Mitchell name is hailed as a leader in the hair-care industry, and many hairstylists began their careers at the 27th annual educational extravaganza Caper held here in Las Vegas. 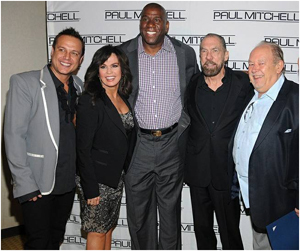 Paul Mitchell co-owners John Paul DeJoria and Angus Mitchell are Las Vegas regulars, and the company’s artistic director, Robert Cromeans, runs the Paul Mitchell Schools and three salons, one of them at Mandalay Bay. Magic Johnson, Marie Osmond, Tabatha Coffey and Kathy Buckley were guests at the Caesars Palace meeting attended by 2,500, and I had the privilege of reading Mayor Carolyn Goodman’s proclamation of Paul Mitchell Day. “We come to Las Vegas every year for this, and it’s always a great visit from start to finish. It all goes smooth as clockwork with the professionals doing hair, makeup, modeling, cutting, color and fashion presentations,” Angus said.